Choose from 22 hotels and guest houses in City of Bristol. Shown below a just a selection of the hotels available. To search within an area please use the menu on the right. 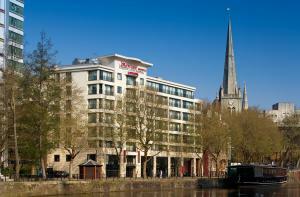 Centrally located, Radisson Blu Bristol is near the historic Old Town, with its many bars and restaurants. 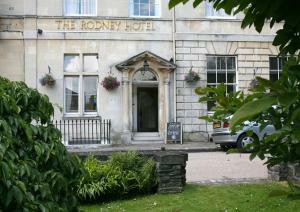 The hotel is a short walk from Temple Meads Train Station. All rooms are stylish and contemporary in design and are furnished with a flat-screen TV. Free Wi-Fi internet access is available in the rooms. The Filini Restaurant and Bar serves excellent cuisine with an Italian influence. With views out on to Broad Quay, The Lounge Bar offers the perfect place for guests to relax. In Bristol's historic Harbourside district, just one mile (1.6 km) from Bristol Temple Meads Railway Station, the hotel offers great value, with comfortable en suite rooms and a restaurant and bar. The Ibis Bristol Centre is just a few minutes' walk from the Hippodrome Theatre and the heart of the city centre. The hotel is easily accessible from the airport via the M32 motorway. All of the en suite rooms have TVs and internet access is available at an additional cost. There is a bar, a cafe and reception is open 24 hours a day. Hot snacks and drinks are available around the clock. There is a secure public car park nearby, with discounted parking available for guests. Within the city of Bristol, this historical Georgian building offers a country-house atmosphere with its walled garden and stable block, 1 mile (1.6 km) from the M5 (junction 17), on a direct bus route. The elegant dining room at the Henbury Lodge Hotel provides a relaxing atmosphere in which to enjoy a range of dishes. A variety of fresh, carefully selected seasonal ingredients from a local farm shop are used. With a small team of friendly staff, Henbury Lodge has secure wired internet access and a large flat-screen TV with Freeview channels in each of its comfortable bedrooms. Parking is available within the hotel grounds. Just off the M5 (junction 17) and close to the M4/M5 interchange, this modern hotel offers free parking and spacious, modern en suite rooms with Freeview TV. Just north of Bristol, the Premier Inn Bristol Cribbs Causeway is within walking distance of The Mall shopping complex, with ten-pin bowling and a cinema also very close by. Some rooms can take 2 adults and up to 2 children (under 16 years). The 2 children also get a free full breakfast when accompanied by an adult eating a full breakfast. The full all-you-can-eat breakfast has the expected cooked items, including vegetarian sausages, as well as a wide continental selection. The on-site restaurant and bar are light and airy, offering good food and drink at reasonable prices. Within walking distance of Filton Abbey Wood Rail Station, this Premier Inn hotel has free parking, modern en suite rooms and Quincey's American restaurant. 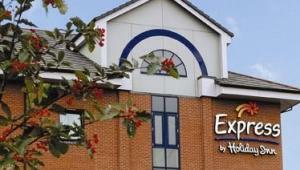 The Premier Inn Bristol Filton is within easy reach of the M4 and M5 motorways. The nearby rail station has regular trains to Bristol Temple Meads. Some rooms can take 2 adults and up to 2 children (under 16 years). The 2 children also get a free full breakfast when accompanied by an adult eating a full breakfast. The full all-you-can-eat breakfast has the expected cooked items, including vegetarian sausages, as well as a wide continental selection. 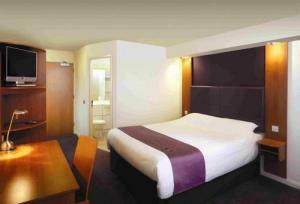 A Premier Inn hotel with air-conditioned rooms and a superb central Bristol location. Next to modern bars and historical pubs, you can walk to theatres, city-centre shops and the harbourside. Beside the river on King Street, this Premier Inn Bristol City Centre hotel is only a few minutes' walk from the Colston Hall, Hippodrome Theatre, Arnolfini Art Centre and the At Bristol complex. Cabot Circus and Broadmead shopping areas are also within walking distance. Some rooms can take 2 adults and up to 2 children (under 16 years). The 2 children also get a free full breakfast when accompanied by an adult eating a full breakfast. The full all-you-can-eat breakfast has the expected cooked items, including vegetarian sausages, as well as a wide continental selection. 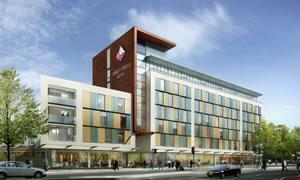 Ibis Bristol Temple Meads Quay is very close to Temple Meads Railway Station. It is walking distance from Cabot Circus Shopping Centre, Harbourside, Temple Gate offices and the city centre. Within easy reach of the M32 motorway, the hotel offers non-smoking rooms and features an on-site restaurant and a bar. A car park is available a short distance from the hotel (at an additional cost). On the quayside of the Floating Harbour, The Bristol Hotel is surrounded by the best of Bristol's old city and maritime history. Enjoy luxury rooms, chic cuisine and a superb location. Surrounded by museums, arts galleries and theatres, The Bristol Hotel is very close to some of the city's historic gems, cultural highlights and business districts. The Bristol Hotel is right next to The Arnolfini, Bristol's celebrated arts centre. Bristol Old Vic theatre and the beautiful Queen Square are an easy stroll across the road. The popular harbour-side '@Bristol' ('At-Bristol') complex is a short walk across Pero's Bridge, along with the Watershed Media Centre. If the location is not enough, The Bristol Hotel offers fresh, modern luxury in its bedrooms, and superb food and quayside ambience of its River Grille and Shore Caf? Bar. Situated on a beautiful Georgian terrace in the historical village of Clifton, the hotel is ideally located for business or leisure trips to the wonderful city of Bristol. Currently re-branding itself as one of Bristol's most elegant establishments, the hotel offers a contemporary twist to compliment the original Georgian features, they offer a perfect blend of modern comfort and convenience with classic style and grace. The welcoming and efficient staff at the Rodney always aim to tailor services to your individual needs, making it an ideal 'home-away-from-home' for your stay in Bristol. With a fabulous location, next to Bristol Cathedral and the historic waterfront, this Victorian-style hotel offers timeless, classical elegance, with polished marble, warm mahogany and gleaming brass. Following a ?3 million refurbishment completed in 2008, the Bristol Marriott Royal Hotel now offers 242 comfortable and spacious rooms and suites. All of the en suite accommodation has large work areas and high-speed internet access available at an additional cost. Some of the rooms have views of the river, while others have views of College Green or Bristol Cathedral next door. The hotel bar offers afternoon teas and delicious cocktails, while the outstanding Palm Court Restaurant offers the finest international specialities and great wines to complement your meal. The hotel also boasts a Roman-style leisure club, featuring superb relaxation facilities including an indoor swimming pool, a sauna and a well-equipped gym. There is also an on-site spa offering a variety of relaxing and therapeutic spa treatments. A 5-minute walk from Bristol Temple Meads Station, close to city-centre leisure and shopping, Novotel Bristol has spacious rooms, sauna, gym, bar with Sky Sports, and great family facilities. Within walking distance of Bristol's city-centre waterfront, the Novotel Bristol Centre is around 9 miles (14.5 km) from Bristol International Airport. Each bedroom at the Novotel Bristol offers fresh modern touches, such as the facility to play your MP3 through the TV sound system. Up to 2 children (under 16 years) can stay free (with breakfast) when sharing a room with adults. This includes access to video games, baby equipment and a healthy children's menu. Families also get late check-out on Sundays (until 17:00). Relax with a meal in the Elements restaurant, while the Elements bar is open until 01:00. Wi-Fi options are available, and there is a 7-room conference suite for up to 200 people. Half a mile (1 km) from Bristol city centre, these luxury, fully furnished modern apartments provide secure parking, free Wi-Fi access and a 42-inch (106 cm) flat-screen TV with over 140 channels. In Beaufort Court, the Bristol Serviced Lettings apartments are half a mile from the Cabot Circus shopping development and 1.3 miles (2 km) from both Bristol Temple Meads and the bus station. The M32 (junction 3) is half a mile away, offering easy access to the M4/M5. Each apartment is furnished and decorated to a very high standard. You will have a living/dining area and a fully fitted kitchen, with washing machine, microwave, fridge/freezer, oven, hob, cutlery, plates and wine glasses. A major bus stop is located just a few yards from the apartments. A full leisure centre is 100 metres away. Bristol Serviced Lettings are child-friendly and will provide a travel cot free of charge if needed. On the beautiful waterside in the city centre, this modern hotel will accommodate all needs with well-designed modern rooms and the best attractions right outside. The Mercure Brigstow Bristol is in a prime position on Welsh Back, with a wonderful riverside frontage. The Brigstow is designed and finished with care, with all of the bedrooms offering comfort with a modern feel. There's even a plasma-screen TV in the bathroom. For business guests, each bedroom has a well-lit desk and access points for computers, and the hotel has a fully equipped business centre. 'Assembly' at the Brigstow is a dedicated service for successful event hosting. Ellipse, the AA Rosette award-winning restaurant and bar, offers a varied menu with a selection of regional specialities and modern cuisine. Next to Marlborough Street Bus Station, a short walk from the Broadmead and Cabot Circus shopping areas, this Premier Inn hotel has a superb city-centre location and family-friendly rooms. The Premier Inn Bristol City Centre (Haymarket) is within walking distance of Bristol's historic sites, yet also convenient for the M32 motorway. The Bristol International Airport Flyer travels between the bus station and the airport. Some rooms can take 2 adults and up to 2 children (under 16 years). The 2 children also get a free full breakfast when accompanied by an adult eating a full breakfast. The full all-you-can-eat breakfast has the expected cooked items, including vegetarian sausages, as well as a wide continental selection. The hotel has its own on-site Beefeater restaurant, serving fresh char-grilled food. A 10-minute drive from Bristol city centre and only 30 minutes from Bath, this Premier Inn hotel is very close to a cinema and has free parking, en suite rooms and a Table Table restaurant. The Premier Inn Bristol South is 10 or 20 minutes' drive from Ashton Court (for the annual Bristol International Balloon Fiesta) and Ashton Gate (home of Bristol City FC). Some rooms can take 2 adults and up to 2 children (under 16 years). The 2 children also get a free full breakfast when accompanied by an adult eating a full breakfast. The full all-you-can-eat breakfast has the expected cooked items, including vegetarian sausages, as well as a wide continental selection. Close to the city's vibrant centre, opposite Temple Quay and just a 2-minute walk from Bristol Temple Meads railway station, the hotel provides the perfect location from which to explore Bristol. The City Inn Bristol has 167 comfortable, modern rooms. Each room has a newly installed iMac in-room multimedia entertainment system. This stylish and innovative system is both an entertainment system and acomputer, allowing you to work or play. Surf the web, watch digital TV, listen to digital radio, play CDs and DVDs or use it like an ordinary iMac. The hotel also boasts a cosy lounge bar and City Caf?, which offers award-winning modern European cuisine. There is also a stylish terrace overlooking Temple Gardens for relaxed al fresco dining. Whether you are staying in Bristol for business or a weekend break, City Inn provides the space to live, work and relax. The hotel embraces light and space, style and comfort to create a stylish alternative to traditional, large hotels. In the heart of Bristol, a 5-minute walk from Temple Meads Train Station, this 4-star hotel has a unique restaurant and the fully equipped Sebastian Coe Health Club. The Ramada Bristol City Hotel offers a beautiful restaurant housed in the remains of a 17th-century glass-blowing kiln. There is also a lounge with a wide variety of hot and cold food. Room service is available 24 hours a day. Each modern en suite bedroom has a flat-screen satellite TV (with in-house movie channel), radio, hairdryer, trouser press/iron, direct-dial telephone and tea/coffee. The Ramada Bristol City is very close to the The British Empire & Commonwealth Museum. City-centre shops are a 10-minute walk away. You could even drive to Bath in just 30 minutes. With spacious, air-conditioned rooms and free parking, the Future Inn Bristol is in the city centre, next to Bristol's newest shopping centre, Cabot Circus. The Future Inn Bristol is a 10-minute walk from Bristol Temple Meads Station and easily reached from the M4, M32 and M5 motorways. Each bedroom offers free internet access (via TV) and free local telephone calls. Free newspapers are available to read in reception. The Chophouse Restaurant and bar provide on-site food and drink facilities. Parking is available at the next-door multi-storey car park (free of charge - ask reception to validate your ticket). Close to Bristol's greatest attractions, this modern 4-star hotel boasts an indoor pool, a spa, a fitness suite, an AA Rosette award-winning restaurant and adjoining, themed family bedrooms. The Mercure Holland House is a luxury 4-star hotel in the city centre hotel, just 10 minutes walk from Bristol Temple Meads train station. 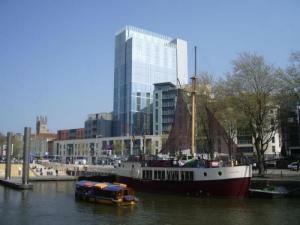 The hotel is located within minutes of Broadmead shopping centre and Bristol harbour. There are many local bars and restaurants and you can take advantage of the hotel's free bicycle rental and explore the area. The hotel is well positioned for shopping, with the new Cabot Circus shopping centre within easy reach. There are 275 en suite rooms, each with a large modern bathroom and contemporary comforts and facilities. Wired internet access is available in the rooms, free of charge. The hotel can accommodate tourists and business guests with unrivalled hospitality and provide useful advice on what to see and do in Bristol. The Thistle Grand Hotel is not only Bristol's oldest hotel, but is also one of the city's finest 4-star hotels, in the heart of the city centre. The Grand offers the superb Tyrells restaurant, as well as its very own underground cellar bar, Marlows. The leisure complex at The Grand includes a pool, beauty treatment rooms, a sauna, a steam room, a jacuzzi and a state-of-the-art gym. The Grand was opened as a purpose-built hotel in 1869, catering for all ladies, gentleman and royalty alike. The hotel continues this tradition today. In the heart of Bristol, close to all of the city centre's businesses, shops and attractions, this 4-star hotel offers spacious accommodation and modern facilities, including an indoor swimming pool. With well-equipped, modern accommodation in the heart of this historic city, the Bristol Marriott Hotel City Centre offers a wonderful mix of traditional and contemporary Bristol. There are 300 spacious en suite rooms, each with a minibar and air conditioning. High-speed internet access is available at an additional cost. 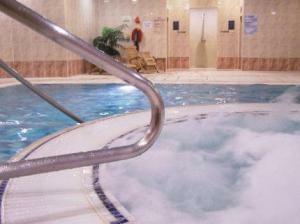 The hotel has an indoor swimming pool with a whirlpool and a fully equipped modern gym. The Mediterraneo restaurant features a wonderful selection of international cuisine and fine wines. The on-site Costa Coffee shop offers breakfast and lunch in a relaxed setting. The superb location means that Bristol's bus and train stations are less than a mile away and the new Cabot Circus shopping centre is right on the doorstep. Cabot Circus houses over 120 stores, including Harvey Nichols and House of Fraser.